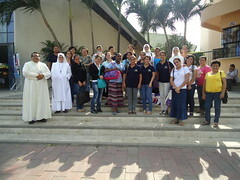 On Saturday December 15th the sisters of Guayaquil organized a silent retreat. The retreat was held in the parish of "Los Ceibos". There they let us use some rooms and a small chapel for prayer. The retreat began in our chapel in "El Condor" at 7 a.m. with Laudes and a time of prayer before the Blessed Sacrament while we waited for those who were going to be our chauffeurs. The sisters asked some friends to do the favor of bringing the girls and women who were going to participate in the retreat to the parish, about a 20-minute drive away. We prayed the rosary on the way there to mantain the atmosphere of silence and upon arriving we participated in the Holy Mass. After Mass, we listened to some points of meditation about the Incarnation and had time for personal prayer. At 11 o´clock we watched a video, the testimony of Bosco Gutiérrez, who had been kidnapped in Mexico and told his extraordinary experience of how this served him to grow closer and convert himself more to God. Lunch was also in silence. Each participant brought her own food and we ate while listening to the story of the three children of Fatima. It helped us to see their spirit of sacrifice. It was a very enriching day. We give thanks to God and to all those who made it possible.